Santorini, we've all seen photos of the picturous villages and white sandy beaches on this Greek archipelago. But many of us are probably unfamiliar of the rich wine-making tradition (3500 BC) on these islands - particular the main island of Santorini. 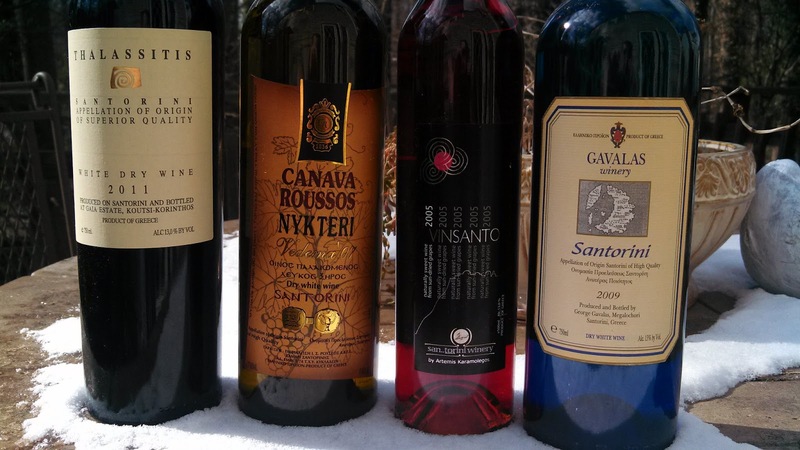 We were very unfamiliar; until we received a care package of wines from the Wines From Santorini. Here's what we learned. The current geographic layout of Santorini is the result of a massive volcanic eruption in 1600BC that created the central lagoon and surround islands. The inhabitants were destroyed, but a few vines survived which may be the lineage to the most important indigenous wine grape: Assyrtiko. Along with Athiri and Aidani, these grapes comprise the majority of Santorini white wines as well as Vinsanto (Italian: "holy wine"). This is a dessert wine made from sun-dried grapes, then aged in barrel; a Mediterranean delicacy for centuries. Grape growing on Santorini is quite unique. Because of the volcanic eruption, the limestone base is covered with chalk, slate, ash, and lava. This composition helps to create wines with a naturally low pH level and high acidity. The lack of clay in the soil also creates a natural barrier to the Phylloxera louse which has never ventured onto the island. As a result, the vines are some of the oldest, ungrafted vines in the world. Finally, rainfall is quite rare, but the vines are "watered" at night by a mist that rolls in from the Aegean. The seas also bring heavy winds so the vines are pruned like a cylinder in order to protect the fruit. The result of this hot, dry, climate is very low yields - averaging 25 hl/ha. And all the wines are protected under the "Santorini" OPAP designations of origin. The first wine we sampled was the Gavalas Winery 2009 Santorini a 90-10 blend of Assyrtiko and Aidan. The Gavalas family has been producing wine for three centuries and the grapes from this wine were harvested from the "vineyard of Santorini" that is considered to be the oldest in Greece; perhaps even the world's oldest continually cultivated vineyard. Pretty amazing. Only 25% of the juice is extracted from the grapes which is then fermented in stainless steel. The wine starts with a citrus aroma mixed in with a slight dose of salty air. The wine tastes fresh and clean, with hints of minerality and decent acidity. Very natural and nicely done. The next wine was the Gaia Estate 2011 Thalassitis, 100% Assytiko. This winery is a youngster in relative terms, having opened in 1994. The owners, Leon Karatsalos and Yiannis Paraskevopoulos, started the winery in part to save an old tomato processing plant from being lost to the modern world - i.e tourism. Their Thalassitis (“Thalassitis Oenos” Greek for sea-originated wine) is named for the ancient practice of mixing wine with sea water apparently for therapeutic reasons. Did they know something we are missing today? Instead the owners of Gaia Estate believe that their proximity to the Aegean Sea creates a similar affect and provides the Thalassitis with a unique flavor. That, and 80-year old vines. The wine is bigger than the Gavalas with even more acidity but with the same mineral and and sea salt characteristics. This is your "Wow" wine, which was simultaneously proclaimed at our table causing a jinx comment from our son. Wow. Finally, we moved to a vinsanto, the Karamolegos 2005 Vinsanto to be precise - a blend of Assytiko and Aidani. These grapes were sun-dried for twelve days, fermented two months in barrel, followed by two years aging in more oak. The result is a blood orange wine with raisins, honey, nuts, and vanilla popping up at various stages in the palette. The wine is syrupy - but not sickening so - with a long finish that invites you back for more. This is something else. We were first introduced to this style from a Cretan Wine exhibit at the South Beach Wine & Festival years ago and promptly forgot. Not anymore. Here's to hoping we visit Santorini one day. Cheers.